The diesel engine is the most efficient powertrain among all known types of internal combustion engines. Heavy trucks, urban buses, and industrial equipment are powered almost exclusively by diesel engines all over the world. Its low energy requirement also makes it an interesting candidate to become the "Engine of choice" for the future, especially as it can be easily adjusted to operate with alternative "Non-fossil" fuels, reducing the impact on our environment and health. Before that happens, however, further advancements are needed in the reduction of engine exhaust emissions, such as Diesel particulate matter and Nitrogen oxides, the two most troublesome components of diesel exhaust. Diesel combustion process results mainly in the formation of carbon dioxide and water, as detailed in Figure 1. 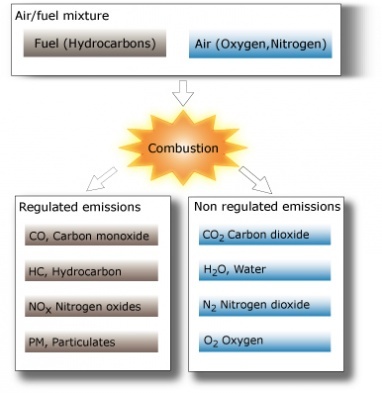 Carbon Monoxides (CO), Hydrocarbons (HC) and Particulate Matter (PM) are products of incomplete combustion. In the combustion chamber under influence of high temperature and pressure, nitrogen in the charge air is oxidized Nitrogen Monoxide (NO) and Nitrogen Dioxide (NO2). In the exhaust system part of the NO is further oxidized to Nitrogen Dioxide (NO2), which is the main contributor to the formation of smog and acid rain. The process of NO to NO2 oxidation continues in the atmosphere under the influence of atmospheric conditions. There are two main after-treatment devices being used to reduce PM, HC and CO from engine exhaust - oxidation catalysts and particulate filters. An oxidation catalyst converts CO and HC to CO2 and H2O. It also reduces PM by oxidizing heavy hydrocarbons adsorbed on carbon particles at low temperatures. Unfortunately, oxidation catalysts do not affect black carbon particles, the core components of particulate matter. At typical engine exhaust temperatures, a catalyst would normally reduce CO & HC in the order of 80%, and particulate matter by approximately 25%. To be able to obtain higher levels of particulate matter reduction, the carbon particles in the exhaust stream must be removed. It can be achieved by the use of particulate filters, where the particles are captured by a filter media. The filter media collects particulate matter which is oxidized in the reaction with oxygen. The higher the temperature the higher the amount of carbon burnt. This process of oxidizing of collected PM is called filter regeneration. Modern filters are capable of reducing emissions of PM by approximately 90-95%. In a passive filter system, the particulate matter is being burned off continuously without any additional energy. In an active system additional energy is used to commence regeneration process. It can be achieved through injection of fuel in the exhaust, which increases exhaust temperature or through the use of catalytically active fuel additives, which promote low-temperature catalytic oxidation. Exhaust Gas Recirculation (EGR) technology has great potential for reducing emissions of NOx from diesel engines. There are two distinctively different types of EGR available. The, so called, High-Pressure EGR (Fig. 2) re-circulates exhaust between the two high pressure points - exhaust manifold and inlet manifold (downstream of an intercooler). The Low-Pressure EGR (Fig. 3) re-circulates exhaust between the two low pressure points - exhaust system tail pipe (downstream of a PM filter) and turbocharger inlet (downstream of an air filter). When part of the exhaust gases is re-circulated to the intake air the oxygen content is decreased and the heat capacity is increased resulting in lower peak combustion temperature and less nitrogen monoxide formation. Decrease in oxygen content causes increase in the amount of PM produced. Therefore, it is essential to control EGR rate at various engine operating conditions. The differential pressure across the EGR line on a high-pressure EGR system is limited and achieving sufficient EGR flow rates is a challenge. As such, required differential pressures must be created artificially by altering the efficiency of a turbocharger or by introducing other sub systems. The problem with achiving sufficient EGR flow rates does not exists on a low-pressure EGR system as other means of achieving required EGR rate are available without de-rating efficiency of a turbocharger. High-pressure EGR re-circulates unfiltered exhaust causing contamination of the engine itself and lubricating oil with soot. Contrarily, the low-pressure EGR re-circulates particulate matter free exhaust taken from downstream of the PM filter. Selective Catalytic Reduction (SCR) of NOx means reducing it to nitrogen (N2) and oxygen (O2) over a specially formulated catalyst in the reaction with a reductant. The most commonly used reducing agent is ammonia (NH3) in the form of urea. Although high levels of NOx reductions can be achieved this technology presents several practical challenges  filling and storage of urea, limited distribution network, etc. The technical challenges include complicated urea handling and dosing system, requirement for high temp exhaust for a catalyst to be efficient, control of ammonia slip during transient conditions and large volume of catalyst required. Certain compounds can adsorb NOx in the exhaust gases. Catalysts containing barium oxide were tested and the results showed that adsorption was most effective at temperatures close to 750° F (approx. 400° C). The catalysts have a limited storage capacity and needs to be regenerated in order to regain activity. The regeneration is done under stoichiometric conditions and the adsorbed NOx dissociates to nitrogen. This type of catalyst is interesting for the development of petrol lean-burn engines which run with excess air except at high loads when the engine runs stoichiometric. To obtain regeneration conditions in diesel exhaust gases is a great technical challenge which is enabled by the use of electronic fuel injection and injection of fuel to the exhaust gases. Also, the catalysts tested are sulphur sensitive.